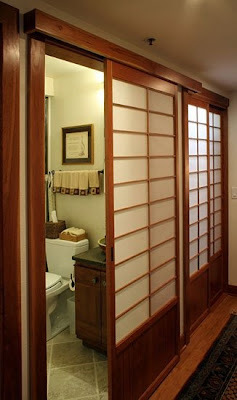 Sliding door is a special door design in Japanese culture, all Japanese culture have a high sense of art, on home design, Japanese culture was a best home design on culture, they can build a house with high quality and have a high resistance with wind and earthquake. The basic Japanese home design is the choice of the material. Wood is the favorite material for the floor, door, roof and also the wall. The special wall and floor design is called "shoji", a special screen made of paper and wood framed. Cherry and Amber Kinwashi Paper is the favorite material for the wall and the door (shoji). 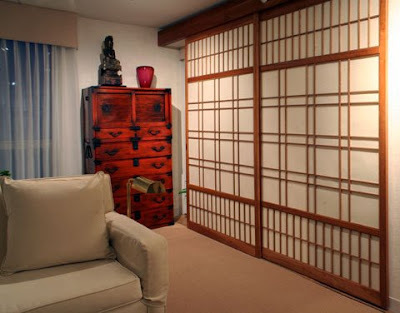 On this picture, I found the design of living room with traditional wall screen named shoji from shojidesigns.com.